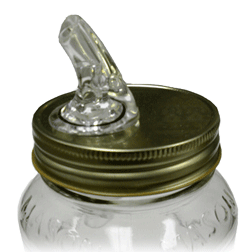 We carry mason jar lid pour spouts, which are often referred to as moonshine pour spouts due to the fact that mason jars were once commonly associated with storing moonshine. But having to screw off that mason jar lid every time you need to serve a drink is a hassle. Moonshine spouts have pourers built right in to the jar’s lid. You can keep your drinks safe from contaminants and easily accessible at the same time! Reach out to us if you have any questions about our extremely popular mason jar spouts.